Born in Ghana and immigrated to Canada in October 1995 with his mother, four big brothers, and sister to join his father. Sampson completed his High School at Mont Royal High School, followed by his College Education. He graduated from Dawson College in General Social Science. After the completion of his DEC, he took a year vocational course to become an Aircraft Sheet Metal Technician. He worked with Air Canada for about two years. Sampson also worked as a clerk at Dawson College in the Center for Training and Development Department. He graduated from Concordia University in 2011 with a Bachelor of Arts, majoring in Theology. Upon completion of his first degree, he entered McGill University to commence his Master of Divinity Program. He received a second degree in Bachelor of Theology at McGill University and His Master of Divinity Diploma from the Presbyterian College, Montreal in 2014. Sampson graduated and was honored with a preaching award. Sampson growing up in a Christian home and in his home church, GPCM was a very active member. He served in many facets of his home church. 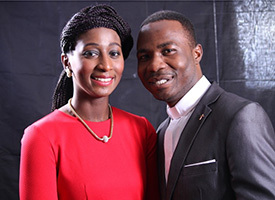 He served and led the youth group as a Coordinator, then became the Vice-President of the Young Adults Group. Serving and leading the youth group by example led him to become the President of the youth group. As a leader of the group; he also acquired the skills to teach the youth group and the junior youth group. Sampson was a member of the church choir and the praises and worship team. He continues to use his gifts in his ministry. Sampson loves studying the Word of God. He also enjoys playing drums, bass guitar, and above all, he enjoys singing to the glory of God. In addition, he loves sports, especially, playing and watching soccer. While studying at Dawson College, he played in the Dawson Men AAA soccer team. After graduating from Dawson, he offered his services coaching the team with experienced coaches. Besides Sampson’s leaderships in the church, he also brings with him a team-spirit which draws the church community together. 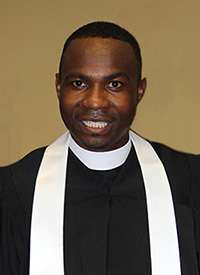 On the 28th of September 2014, Sampson was ordained and inducted as a Minister of Word and Sacrament at Montreal West Presbyterian Church in the beautiful community of Montreal West, where he is privileged to serve in a pulpit that has long had a reputation for solid biblical teaching and a clear proclamation of the Gospel. 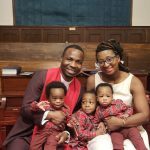 Sampson and his beautiful wife Dorothy Kra consider it a real answered prayer to have been called to a congregation that welcomes all people and expresses their love of the Gospel to the community and beyond its territory. Sampson and Dorothy are blessed to share in this journey of faith with the lovely people at MWPC. Dorothy, an educator brings her gifts and shares in the ministry. Dorothy offers her gifts with the Children’s ministry as the new Superintendent of the Sunday school.